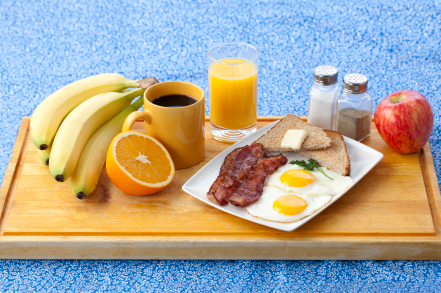 A good balanced breakfast should represent one-quarter of the day's energy intake, about 500kcal, and be composed of at least four elements. A cereal product (bread, cereals, rusks ...) for its intake of carbohydrates, fibers, B vitamins and minerals. A dairy product (milk, cheese, yogurt, cheese ...) for its proteins, calcium, vitamins A, B2, and D.
A fruit or fruit juice for vitamin C and minerals. A drink, very important for the water supply. For one person: 30g of cornflakes, 1 natural velvety yogurt, 50g of apple, 10g of raisins, 50g of banana, 1 roll of milk, 10g of instant chocolate powder, cinnamon powder, liquid vanilla. E pluck the apples and cut into thin slices, cut the banana into slices, add the raisins. Sprinkle with cinnamon, flavor a few drops of vanilla, add yoghurt and cereal. Serve with a milk loaf and hot chocolate. For one person: 30 g of special K, 150 g of lean white cheese, 150 g of parma ham, 50 ml of skim milk, sweetener, tea, milk. Arrange in a cup of sweetener, cereal and melon cut into pearls. Add a slice of ham. Accompany with a tea or milk.